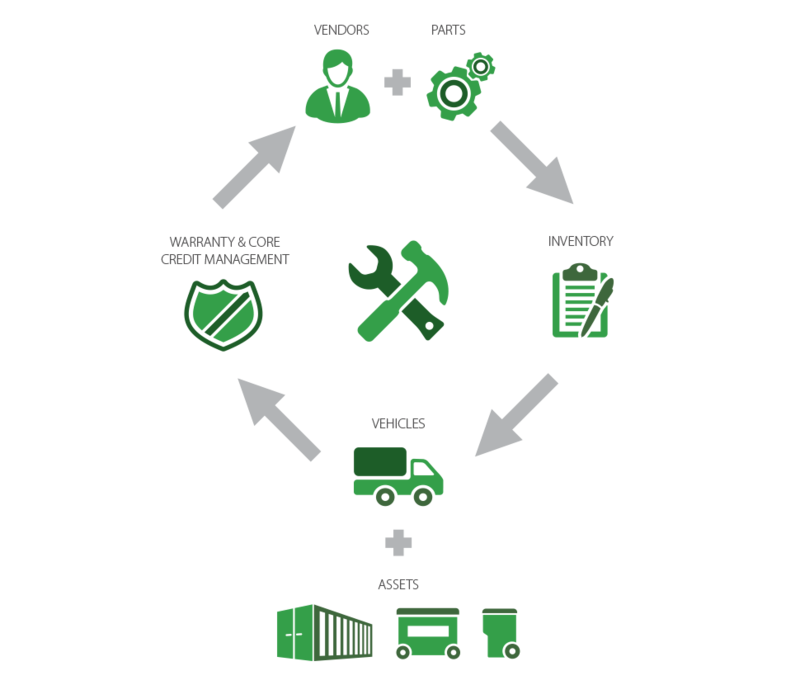 TRUX Maintain-IT is our Asset Tracking Software, Maintenance Software and Parts Inventory Software for haulers and facility operators. Click on the + next to each benefit for details. by streamlining the transactional processes of your business. Managing your maintenance department effectively adds to the bottom line allowing for re-investment in equipment and employees to further drive the bottom line. User friendly interface for efficient entry of information. 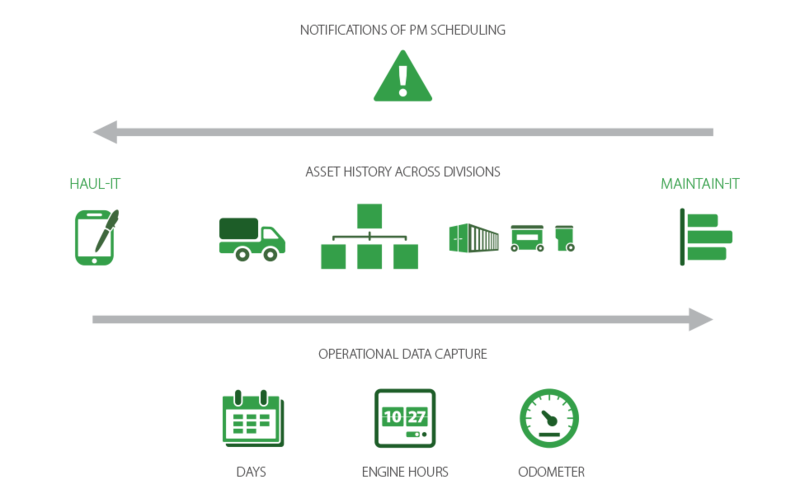 Seamless integration of TRUX Haul-IT operational data ensuring up to date Maintenance Schedules. to deliver exceptional service to your customers. TRUX Maintain It is driven by customer input and is constantly evolving to provide your people with the tools necessary to ensure information is entered and managed in a user friendly environment. Providing service to your customers is dependent on your vehicles being up and running ready to perform that service. Drivers, Mechanics, Maintenance Support Staff and Management all have a part in ensuring vehicles are operating and on the road ready to provide service to your clients. One of the keys to providing quality service is accurate, timely information that is available at any time. 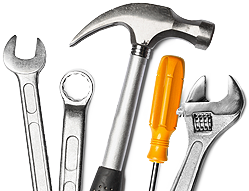 Maintain It provides the tools that will allow you to enter, review and manage your asset maintenance needs. DOT Inspections are not a problem. Information entered for each asset is available and at your finger tips with the click of a button. Repairs by date, asset or asset type are available for quick review. Part usage analysis will quickly identify those parts that should be inventoried and others that should not. Back log maintenance for keeping track of future repairs. Remove the guess work from preventative maintenance. Schedules indicate when a vehicle is due for service. Analyse your mechanic productivity to determine if staffing levels are adequate. with an industry-specific tracking system that monitors assets. Part warranty and core credits will not slip through the cracks. Based on part minimums, inventory levels are monitored and order recommendations reduce the risk of part shortages. Preventative maintenance schedule tracking make it easy to avoid under or over servicing vehicles. Repair visibility accurately manages vehicle replacements decisions. Awareness of part purchases and their prices assist in negotiating lower purchase prices from vendors. TRUX Web Portal & Web Services reduces burden on customer service reps by extending selected and secure self-service TRUX functionality to your customers. with meaningful financial and operational reporting. Customers who have sold their business have told us the sale transaction was quicker and results more positive because the TRUX system facilitated the due diligence process. Multiple TRUX customers who sold their business have returned to the industry and selected TRUX without hesitation. TRUX is comprehensive, eliminating need for other software to fill gaps. You company is not too small for TRUX. Nor will it outgrow TRUX. Some early stage companies select a lower cost provider only to realize a higher cost of ownership as they outgrow the system and incur data migration costs and business interruption in order to upgrade. We are really competent at migrating competitive system data to TRUX. We take pride in implementing quickly and with minimal disruption. TRUX will be up and running in less time and with less stress than you imagined. When you have a problem or simply need some guidance, a live member of our support team will pick up the phone. Even our competitors acknowledge that TRUX support is exceptional. Organize, identify and search for parts in inventory. Store images and documents providing a complete record of part history and usage. Setting minimum and maximum levels on each part ensures proper inventory levels are maintained reducing downtime due to shortages and reducing costs associated with over ordering. Electronically create and track part purchases. Manage shipments received. Inventory is automatically adjusted during the process. Track part purchases by individual vendor. Complete pricing history and management of part warranties and core credits. Capture and track parts and labor costs of In House, Road Call and Third Party repairs allowing for a historical costing record of work performed on your fleet. Record and quickly access images or documents associated with any repair order. Ensure quick and accurate data entry on orders by using bar codes to identify parts. Repair Kits allow for streamlined entry on common repair types. Manage scheduling of back log items for those non-safety oriented or non urgent items. Custom definition of calendar or meter based preventative maintenance schedules (days, engine hours or odometer readings). PM Schedule Linkage provides the ability to link A Service to B Service and manage backlog items that may be outstanding but not urgent. Buffer zones identify PMs due soon, giving maintenance staff time to coordinate the assets and resources for service. Management console displaying current PM status for your entire fleet using colour coded status to manage action items. Notifications on Haul-IT route sheet or tablets indicate when vehicles need to be called in for service. 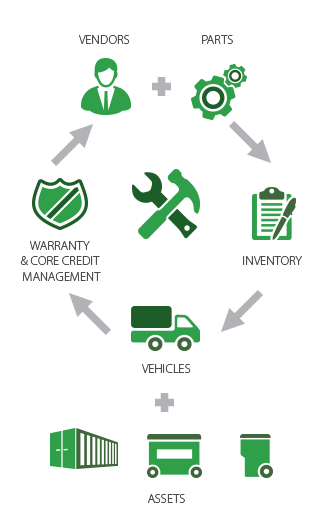 Manage repair costs on all container or compactor units from one data source. Haul-IT Engine Hours and Mileage Entry linked to Maintain-IT PM Tracking eliminate need for duplicate entry in Maintain-IT. Ability to temporarily or permanently transfer assets among operating divisions while making all repair history available to all companies for complete and accurate reporting. Automates month end journal entry postings for QuickBooks G/L users. Data booked to the General Ledger cannot be changed or modified in the sub ledger. Historical asset tracking provides key metrics allowing for informed decision on asset usage and replacement. 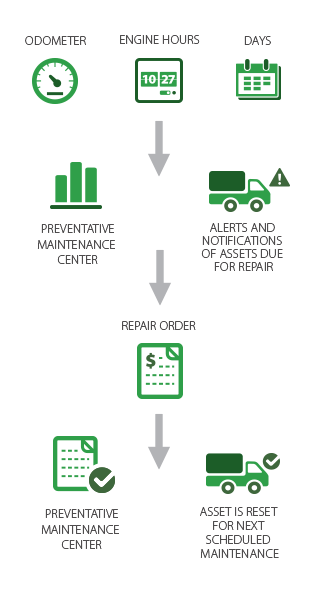 Proactively manage and control parts inventory and monitor carrying costs of parts inventory. Track and report on productivity of direct and indirect labor. Control and monitor unnecessary expenses caused by drivers, assets and/or customers. 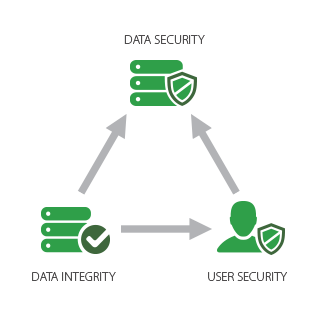 Provide management complete control over what TRUX functionality is available to any user. Designed to provide the fastest retrieval and updating of data. Provides tools to query, manage and schedule back ups of the database. Provides visibility and audit trails of transactional history. Assurance the TRUX application is kept current with Microsoft business environments. © 2014/2015 TRUX. All rights reserved. To request an online demonstration of a TRUX application, please complete and submit this form. Your request will be sent to our sales department and a TRUX representative will contact you as soon as possible.